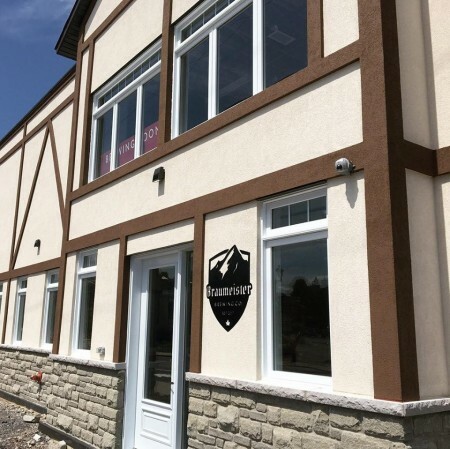 CARLETON PLACE, ON – A new brewery and taproom inspired by the brewing traditions of Bavaria will be opening soon in Carleton Place, a small town west of Ottawa. Braumeister Brewing has been founded by Rohit Gupta, a science teacher who “has been an avid homebrewer for several years, combining his love for science with his love for beer,” and who spent some time living in Austria where he developed a taste for the beer and brewing culture of the area. Together with brewing consultant Sheldon Scrivner, Gupta has developed two flagship brands – Route 21 Märzen (5.5% abv, 22 IBU) and Biergarten Blonde Helles (5% abv, 20 IBU) – as well as a pair of seasonal beers – Stag Head Altbier (5% abv, 25 IBU) and Rheinwasser Kölsch-Style Ale (4.8% abv, 22 IBU) – that will be available at opening. Braumeister held a soft-opening event this past weekend for members of the Braumeister Club (memberships are still available online), and the official public opening was expected to take place today, but has been delayed due to road work in front of the brewery. Once confirmed, the opening date will be announced on social media. Braumeister Brewing is located at 19 Moore St. in Carleton Place, and will have business hours of 2:00 PM to 9:00 PM on Tuesday to Sunday once open. For more details, see the brewery’s website and Facebook page.